* Start with the more complex pages. You will most likely get burned out and having brainless pages for the end will be more encouraging. * I do not give amounts for the fabric because in most cases you can use scraps. What I suggest doing if you don't have a scrap bin started, is to go to the fabric store with two or three pages in mind and buy an 1/8 of a yard of the fabrics you would like. Also, plan to use these fabrics for the rest of the book. For the backgrounds, ask for 10". * For the inside of the pages and reinforcement of moveable pieces, we used a polyester blend that is basically a dense plastic, however, the company we bought it from went out of business, so I suggest using a heavy weight interfacing or thicker felt. For all pages, unless otherwise noted, you will sew through this layer and the background fabric to attach things to the page. * Obtain felt. I suggest buying sheets of felt as you need them rather than getting a bunch by the yard. 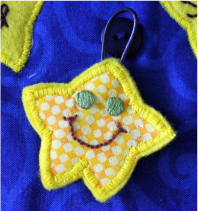 * Use Steam a Seam (fusible webbing) instead of pins for ease. 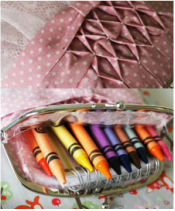 * Most of the pieces are sewn together or to the page using a satin stitch on a sewing machine to prevent fraying. 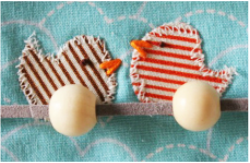 * When cutting the pattern from felt or other thick fabrics, first cut the outline from paper, then use a couple of bobby pins to hold it in place and adjust them as needed. Oddly, the bobby pins are more accurate than straight pins (my good friend Stephanie gave me this tip). * If you do not have a rotary cutter and self healing mat, I suggest either buying or borrowing one. I would love to see pictures of your interpretation of any of these pages and I would be happy to answer any questions if you would like to email me at kitscrafts2012@gmail.com. Creating a cover to bind all of the quiet book pages together. What girl doesn't like to play dress up? Why not incorporate this playtime into a quiet book? 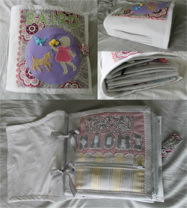 If you are overwhelmed by the idea of creating a whole huge book, just make a mini version of your favorite pages. 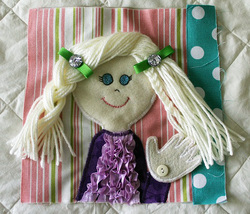 Here is an example of the Dress Up Page as a Mini Quiet Book.